Photo by Jeffrey M. Dean. We all have certain things that bother us, that “get under our skin,” as we often say, things that can powerfully trigger and elicit the strongest of reactions from deep places within us that we perhaps don’t even know are there. Most of us likely have a favorite, irresistible soapbox, a particular axe to grind related to a value perspective, whether it involves a political, religious/spiritual, moral, sociocultural, or some other issue. You know that you are poised on that soapbox and passionately grinding that axe when you find yourself saying things like, “Don’t even get me started,” and you get yourself worked up into a state of emotional frenzy. Mine is, without question, dogmatism. I realize that “hate” is a very strong, and in our current society and culture, a very unpopular word. I don’t care about popularity, and if I knew of a stronger word, believe me, I would use it. I hate, abhor, and detest dogmatism. There are probably no words in any known language that can accurately represent how I truly feel about dogmatism and its destructive consequences. I consider it to be a life mission to oppose and fight against dogmatism wherever I find it and in whatever form it assumes. I assume we are all familiar with this term and the phenomenon to which it refers. However, for the sake of clarity, here, I am defining dogmatism as a way of being or existential mode characterized by an extreme demand for absolute certainty, an uncritical and uncompromising adherence to a particular perspective or belief system, and a fierce opposition toward uncertainty and conflicting perspectives or beliefs. 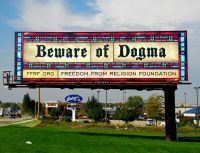 According to such a definition, it is possible to be dogmatic in regard to just about anything—any value perspective or belief is a potential vehicle for the unjust and intolerant reductionism of the dogmatic approach toward life. Therefore, in the political sphere, there are dogmatic conservatives, dogmatic liberals, dogmatic moderates, etc. ; in the religious sphere there are dogmatic Christians, dogmatic Muslims, dogmatic Buddhists, dogmatic Hindus, etc. ; in the intellectual sphere there are dogmatic atheists, dogmatic scientists, dogmatic academics of every discipline, etc. ; one can even be a dogmatic opponent of dogmatism. Of course, an implicit and crucial question must be answered—what it is about dogmatism that is destructive or harmful. My answer to this question is evident within the previously utilized terms “unjust,” “intolerant,” and “reductionism.” Dogmatism, regardless of its particular manifestation, is destructive and harmful because it reduces the full truth of an aspect of reality to something less than what it actually is. It elevates one perspective or belief to a position of absolute authority, thereby negating and devaluing all others that differ from or contradict it. This rigid and severe intolerance toward competing perspectives and beliefs is unjust because it results in a distortion and obscuring of what is true and real, as well as a denial of individual freedom in choosing how to live on the basis of a personal value perspective or belief. I could also cite innumerable current and historical examples of violent and harmful actions toward innocent people resulting from the dogmatic need for certainty or to be “right,” whether in the form of fascist oppression and human rights violations, religious or morally-based “hate crimes,” or an inability to constructively disagree in emotionally-heated debates and discussions. I believe that this compellingly indicates the extremely serious dangers of dogmatism, whatever its particular manifestations may be. What is at stake here is so far beyond a mere intellectual or academic discussion regarding epistemological and moral relativism, or more popularized trainings and messages concerning the importance of celebrating diversity or affirming a tolerant attitude in the context of interpersonal conflict. When we assume a dogmatic position and stance toward an issue we engage in an act of intellectual suicide and homicide, and this means much more than mere difficulties in a safe, abstracted academic inquiry. Concerning the former, we construct an ideological home on a branch and then cut it out from under ourselves or ideologically paint ourselves into a corner. Exclusively clinging to one limited view or perspective leaves nothing for us to stand upon and nowhere to go—we can’t escape the narrow confines of our one perceptual angle and isolate ourselves from the benefit of alternate vantage points. Concerning the latter, as previously stated, we do violence toward truth and reality itself in reducing and distorting it to fit into a partial and limiting viewpoint, and we dishonor the right of a person to maintain a different perspective, impairing his/her ability to discover the real and true through a transformative dialogical encounter. And isn’t this essentially the point? No one individual or group of people can legitimately claim a monopoly on whatever Truth or ultimate Reality is, and we do not discover their meaning in isolation from one another, either individually or collectively in separate sociocultural groups. Not only is it impossible to logically or rationally prove that one particular perspective or belief system is the “True” one in opposition to all the other “false” ones, but it is also apparently not possible that any single perspective or belief could completely or fully represent the whole of Truth or ultimate Reality itself. Indeed, how could it? Following a core theme within our existentialist framework, I think we should acknowledge and emphasize the fact that dogmatism most essentially represents an existential response, and thus way of dealing with, the anxiety inherent to the experience of uncertainty. Dogmatism, among other things, represents an attempted escape from an honest confrontation with uncertainty, which in any form is truly a manifestation of the groundlessness lying at the heart of our human existence. Given the innate limitations of our human nature and the ever-changing nature of our world this must always be a failed attempt. As finite beings in an infinitely complex universe we are not capable of achieving absolute certainty, which in turn, is itself not even achievable. Paradoxically, the only constant is change, the only certainty is uncertainty…the only thing we can know for certain is that nothing can be known with absolute certainty. The way out of the dogmatic nightmare is to relinquish our obsession with certainty and creatively embrace the inevitable uncertainty that remains despite our denials and resistance. It begins with the acknowledgement that as certain as I believe I am about something it is always possible that I may be wrong; it begins with a humble willingness to be wrong and to surrender the compulsive need to be “right” at all cost, waging verbal, ideological, or physical war to prove it. The ultimate cost is not losing an argument or debate, appearing intellectually weak or inferior. It is, rather, the ignorance that prevents growth, life-enhancing discovery, and perhaps eventually even the survival of our species and the very existence of human civilization. Dogmatism is an existential and sociocultural disease that must be curatively destroyed before it destroys us all.